SOF News Update 20181119 – Female soldier passes SFAS, troubles for Gaza continue, Emma Sky interviewed on ME, an Arab NATO, conflict between Taliban and Hazara, Navy SEAL museum on LI, losing Afghanistan, governance in Syria, next gen body armor, AF SERE combatives, GB families sue Jordan, PMCs and squashing an insurgency, MQ-9 drone supporting TFSW in Afghanistan, Dunford on the Taliban, and more. “Unleash the Hounds! First Woman Passes SFAS”, Special Operations.com, November 16, 2018. “Woman Qualifies for Special Forces Training, Could be the First Green Beret”, National Public Radio, November 16, 2018. AF SERE Combatives Program. The Air Force has recently established an advanced combatives program for its SERE specialists. See “SERE Combatives enhancing self-defense”, Air Force AETC, November 16, 2018. Navy SEAL Museum on Long Island. A project to honor Navy SEALs is moving steadily along. Read “Navy SEAL museum on Long Island closer to reality”, Fox 5, November 16, 2018. Green Beret Families Sue Jordan. The families of slain Green Berets killed in 2016 are suing the country of Jordan – charging a cover up of the event. (Stars and Stripes, Nov 16, 2018). McRaven Blasted by Trump. On a news program on Sunday President Trump said Admiral (retired) William McRaven should have caught Osama bin Laden sooner. Editorial Note: Hmmmm. Seems if there was a failure of finding OBL it would have been an intel failure not a SOF failure. (NBC News, Nov 18, 2018). PMCs and Squashing Insurgencies. Dr. Joan Swart, a terrorism analyst, examines the pros and cons of using PMCs in military operations. Read “Should Private Military Contractors Be Used to Squash an Insurgency”, Islamic Theology of Counter Terrorism, November 10, 2018. Reaper Support to TFSW in Afghanistan. The Marines in Helmand province have been utilizing the skills of contractors flying the MQ-9 Reaper. The MQ-9 support is provided to Task Force Southwest and is a key element to the ISR, fires, and security effort. The security situation in Helmand is pretty much a stalemate with nine of the 14 districts in the province controlled or influenced by the Taliban. Read “With Reapers in the sky, Helmand becomes a testing ground for the Corps’ future fight”, Military Times, November 17, 2018. Emma Sky on Power and the ME. A Senior Fellow at Yale University’s Jackson Institute, Emma Sky, is interviewed on the Middle East. She served as an advisor to the Cdr of US forces in Iraq, Afghanistan, and worked several different projects in the Middle East. See “Interview – Emma Sky“, E-International Relations, June 26, 2018. (an older piece but informative). Troubles in Gaza. Geofrey Aronson updates us on the source of the problems in Gaza and attempts by Egypt to solve the dispute. Read Gaza on the Verge, Middle East Institute, November 16, 2018. Arab NATO? Giorgio Cafiero and Cinzia Bianco look at the promise of a regional force in the Middle East. A recent exercise held in Egypt in November by six Arab nations could be the start of a regional alliance. See “Arab Shield 1: The birth of an Arab NATO?”, Middle East Institute, November 13, 2018. Taliban vs Hazaras. Conflict has escalated in districts inhabited by Hazaras that up to now has been relatively secure and peaceful. A company of Afghan Commandos (50 personnel) was sent to reinforce a district hqs but was overwhelmed by Taliban fighters and suffered 30 KIA with many more WIA. Read “Why Are the Taliban Attacking Hazaras in Afghanistan?”, Gandhara RFE/RL, November 16, 2018. Dunford on the Taliban. At a recent defense conference, the Chairman of the Joint Chiefs of Staff – General Joe Dunford – provided a moment of honesty about the current security situation in Afghanistan. Read “Top US military officer says Taliban ‘are not losing'”, CNN Politics, November 17, 2018. Israeli SF Touch Off Round of Fighting. An IDF attempt to boost Israel’s eavesdropping capabilities has prompted a new flareup of hostilities in the Gaza strip. One senior IDF officer and seven Palestinian fighters died in the deadly clash. This set off a bunch of rocket fire from the strip into Israel and retaliatory airstrikes by Israel. (The Times of Israel, Nov 18, 2018). British Paras Back to Afghanistan. Elements of the Parachute Regiment have been sent back to Afghanistan for its first combat mission since 2014. (UK Express, Nov 18, 2018). Pakistan – Key to the Conflict. Sabera Azizi writes about the key role played by Afghanistan’s eastern neighbor in supporting the Taliban and how to end that support. Read “Winning the War in Afghanistan is Possible”, International Policy Digest, November 17, 2018. Governance in Syria. Watch a 1 1/2 hour-long video of a panel discussion entitled Decentralization and Centralization: The Future of Governance in Syria, New America, November 2018. Hosted by Peter Bergen, Vice President of New America. (Starts at the 10 minute mark). Losing a War in Afghanistan, FDD’s Long War Journal, November 16, 2018. A panel discussion addresses the topic of countering the Taliban and understanding U.S. policies in Afghanistan. Jessica Donati (reporter at The Wall Street Journal), Thomas Joscelyn (FDD), and Bill Roggio (FDD) discuss Afghanistan in this video. Videos about National Guard Special Forces. Here are four videos featuring the 19th and 20th Special Forces Group. Each video, produced in 2018, is about 2-3 minutes long. Posted on YouTube by the National Guard. The Latvian Honour Guard, NATO, November 18, 2018. The Freedom Monument in central Riga ad the Riga Castle is protected by the Latvian Honour Guard. This one-minute long video provides a look at the honor guards who do the protecting. Photo: Soldiers firing weapons. 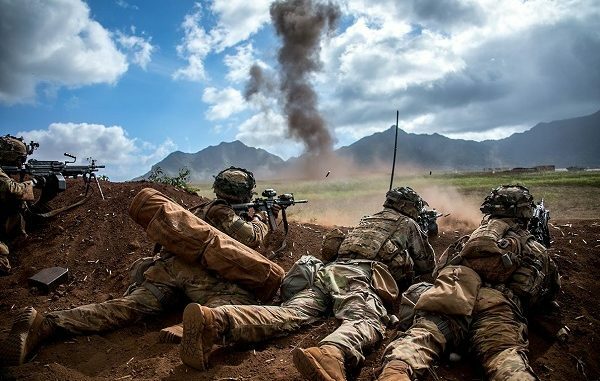 Photo by U.S. Army, 2018.